Model / Style : N 716 "hybrid"
Swimsuit | leotard | hydrasuit | sportsuit with long sleeves, 2way front zipper, highneck with small collar, normal leg cut and covered cheeks (Realise N-Back) - in a new fabric-mix "hybrid" design: body is made of the 700 series rubberized fabric and the sleeves are made of the SSW wetlook fabric. The front zipper is designed as a 2-way-zipper and allowes seductive creative wearing options - from keyhole-look to a complete open collar. The manufacturer´s logo is on the front just little bit above the right leg cut. Body: "700 rubberized series", "Pure made in JAPAN ENAMEL", "Japan ENAMEL", die newest "SHINY RUBBER" version of the popular super shiny rubberized fabric from REALISE - the color "glossy navy" has a shiny metallic finish. The fabric looks like looks like latex, rubber or vinyl. 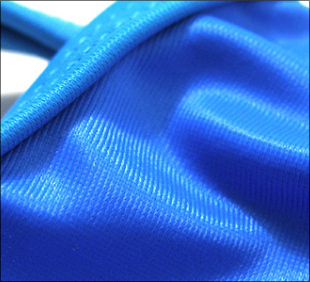 Surface: 100% polyurethane; Lining: 85% polyester, 15% polyurethane. 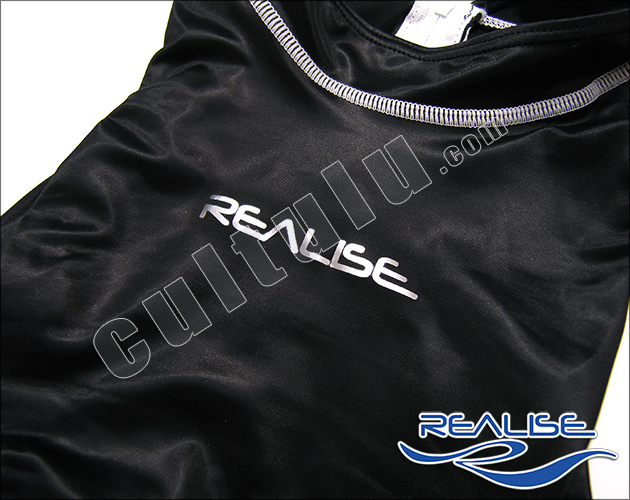 Sleeves: SSW, "Super Shiny Wet", a very thin and stretchy material, that is slightly glossy and feels like Lycra, Wetlook and similar fabrics. 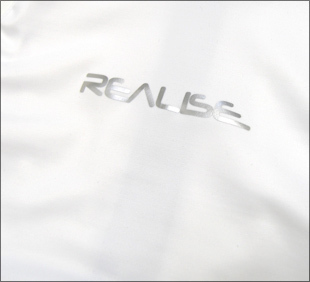 Get more information about the 700 series rubberized fabric and the SSW-fabric at the item menu "Material", or at our Realise material page. This swimsuit is produced in Japanese sizes only. We have translated this sizes to European sizes and created an detailed size chart. 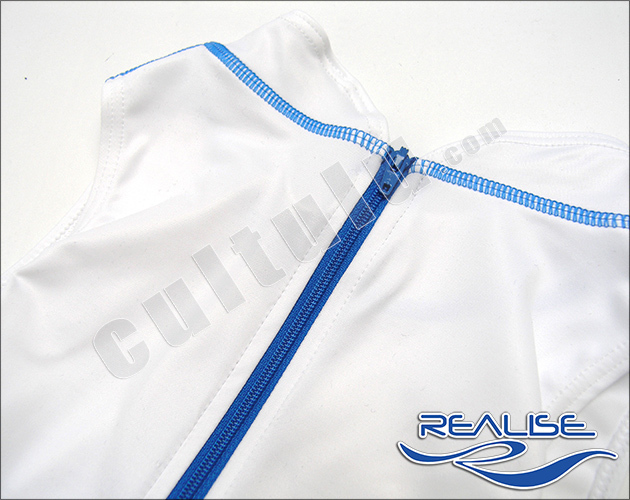 Please get informed about measurements and sizes before your purchase at our Realise size page. 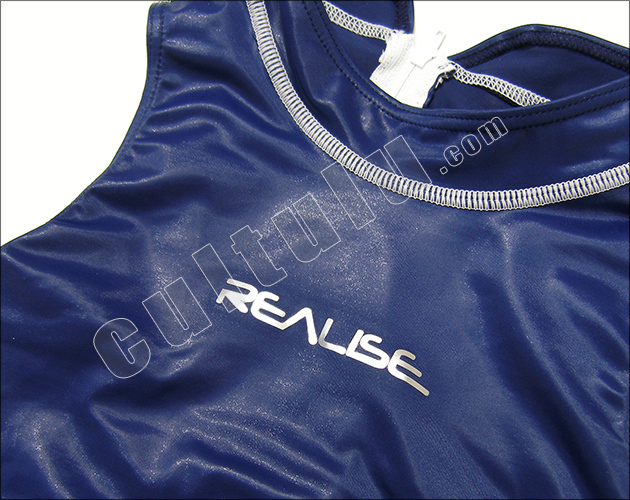 This swimsuit is only produced in Japanese sizes M to 5L (~ UK 4 - 12/14). Size M is not offered regularly at our shop because of less demand and we don´t have any items of this size in stock. If you are interesed in a size M, please get in contact with us via our contact form, we can order for you directly in Japan (waiting time 2-3 weeks). The price is the same as size L.
Accessoires like stockings and shoes, as might be shown in the product images, are not included in the scope of delivery . 700 series, JAPAN ENAMEL, the latest update of the SHINY-RUBBER-material. The material stretches, but the "glossy navy" fabric is a bit less stretchy then the fabric in "gunmetal" (900 series). We recommend strictly to our size chart. The material can be stretched well. You can order this swimsuit up to a half size smaller, if you like it a little bit closer. This material is also ideal for larger bust sizes. Because Realise swimwear is that high requested - we want to offer you preorders on announced swimwear as early as possible. New released products are sold out in no time - especially the bigger sizes. But we have a fix contingent - guarenteed by the manufacturer - and now these swimsuits are already available for your preorders. In the past we had some troubles with the dates of the releases - though I cannot guarantee for the now announced release dates. But don´t worry at all, your reservations are fix and will be delivered as soon as the new products have arrived at my company - for sure. Also possible: if you don´t want to wait any longer - you can cancel your preorder and i will give you a payback in no time. Please note that little changes in design - like logo placement - can happen till release - but when I get informed from Japan, I will let you know immediately.